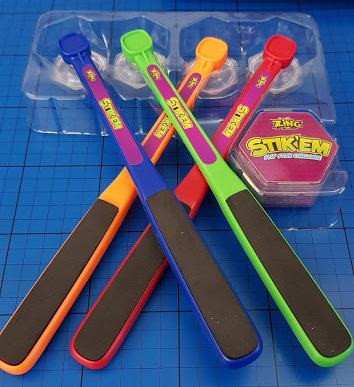 Zing Games make active family games that will keep everyone awake this Christmas. 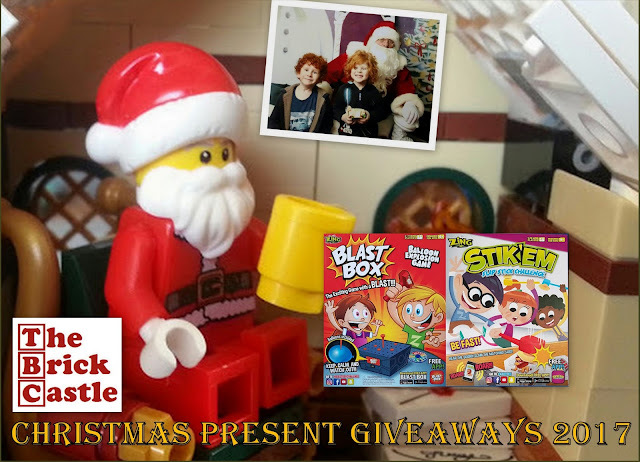 They have given me two of their new games to give away to one lucky reader - Blast Box and Stik’em. Lively and fast-paced, these are party games everyone can play and if your children are anything like mine, they will love them! 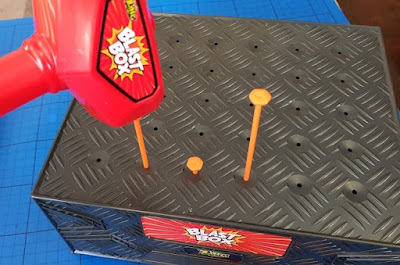 Blast Box (£19.99rrp) is not one for the faint-hearted! Inside the box are a big plastic crate, spinner, hammer, 30 plastic nails (not sharp), a balloon pump and 100 small balloons - plus 20 cardboard fasteners (brilliant because my kids can never manage to tie off balloons themselves). You can see where this is going! Blast Box really has you on edge! 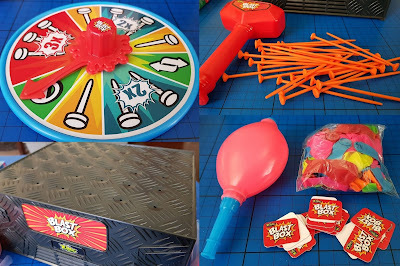 I'm not even scared by small bangs and popping balloons, but when you know it's coming it has the kids squealing with delight! Inflate one balloon per player and put them inside the Blast Box. Use the spinner to determine how many spikes you have to hammer in and off you go. Burst a balloon and you're out! Blast Box has an accompanying free app. but we haven't yet has chance to try it out and it isn't necessary to gameplay. Each game requires 5 minutes set up and lasts around 15 minutes - longer if you are playing with nervous players! Suitable for 2-4 or more players aged 4+. Stik’em Game (£14.99rrp) is another lively and fast-paced game. Suitable for 2 or more players aged 4+, although only 4 can play at once. 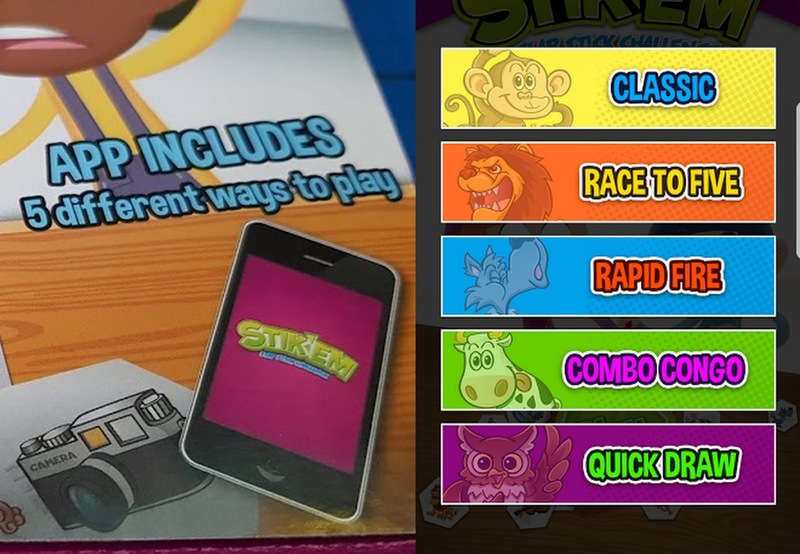 You need the free app to play - unless one player fancies doing the sound effects! Place all the cards face up on the table, arm yourself with a suction cup stick and listen to the randomly played sounds from the app. Find the correct card and slap it with the suction cup to claim it as your own. There are 4 of each card, so it isn't a fight as much as a contest to see who can look and move quickest! There are several different games and my boys tried them all, although the Classic is probably the most all-round popular. None of them are tricky or need any time to learn the rules, and the cards are very clear - even younger players won't mistake any of the sounds. 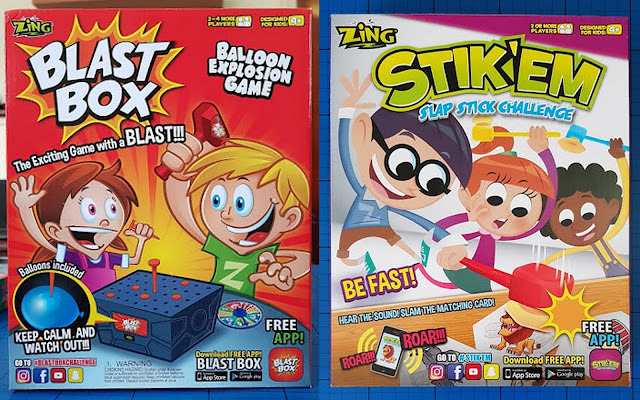 Blast Box and Stik'em are very lively games and ideal for when the younger members of the family need to use up their excess energy. Great fun, well made and very effective. Blast Box (£19.99rrp) and Stik'em (£14.99rrp) are available to buy now from toy shops instore and online, including Argos, Smyths and Amazon (where they are currently discounted). You can find the entire Zing range on the Zing website. 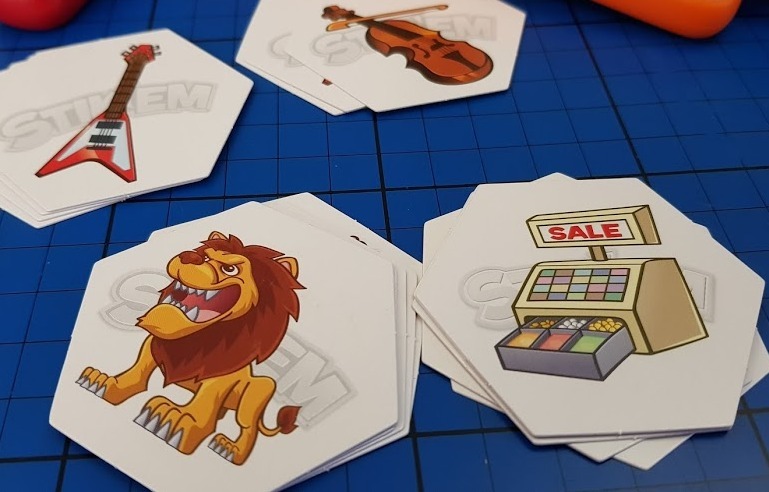 Zing Games have kindly offered one of my readers both games as a Christmas Present. Entry to the giveaway is by Gleam form below. It is open to UK entrants only and will end at midnight Sunday 10th December in time for Christmas delivery. Full terms and conditions are at the bottom of the Gleam form. We were sent our games for review and photos. It has to be KeKer Plunk. My mum really hated the noise of the marbles falling down the tube. I used to have a toy robot that annoyed everyone by laughing manically. I loved it though. It has to be Hungry Hippos! Our daughter had a doll that repeated everything it heard. That was really annoying. A drumming monkey was probably the worst though. Screwball scramble as I would get so loud and frustrated playing it. Me trying to get the wishbone out the body on the game Operation, the buuzzzzzzz sound used to frightened me! Ironically it was Monopoly that annoyed our parents!!! As myself and my three brothers were so competitive there was always lots of shouting going on! Raised on board games and still enjoying them with the family now! Mouse Trap , I remember many times being told to quieten down we were laughing so much. When the kids were little they had this sensory ball thingy that if you touched it it said "I can see you"... it went off in the night once... I was too scared to go and see what it was!!!! I used to have a little Barking dog. It would drive my parents crazy because it always went off at night and my mum would have to get up and push it off. Operation because I used to throw a tantrum when I lost. That was noisy! Operation. That buzzer would drive my Mum insane (especially because we just set it off on purpose instead off playing properly). Sidetrack, we were always popping the dice and clicking the board around! It wasn't a loud one but my mum hated stretch Armstrong, it burst and ended up everywhere! It wasn't a game but I had some balloons in a stocking, they were called rocket balloons...I think. Just long stripy pink ballons, you blue them up with a tube and let them go and they would screech round the room! I'm not sure. Maybe Kerplunk. I think my parents went out of their way to avoid buying us noisy toys. Definately a toy drum someone bought my son, needlessly to say it vanished overnight. My loudest was probably Bop-it and I loved it! Has to be Operation that beeping drove my family mad! buckeroo cus i used to scream every time it jumped! A kermit the frog game that you had to fire counters in to it's mouth. Snap for us too..had to shout really loud! Can't remember the name of it, but it was a kind of Ludo with a dice inside a popping plastic dome. We used to play as fast as possible and the incessant popping noise drove our mum mad.